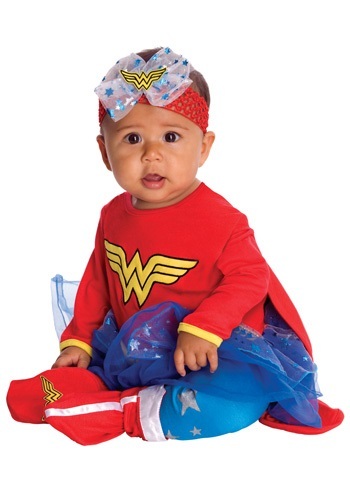 Now your baby can be a super baby with this Infant Wonder Woman Onesie! This infant costume includes a red romper with an attached blue tutu (the blue tutu does not have the pictured stars on it). 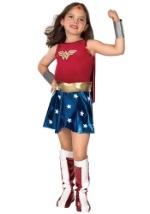 The romper has a sewn on Wonder Woman logo on the front with snaps at the bottom to allow for easy taking on and off. The back of the romper has two Velcro strips to allow the Wonder Woman cape to be taken off if needed. The blue pants have an elastic band at the top so they can be easily put on over the romper. The pants do not have silver stars on the legs as pictured above. The red booties have the Wonder Woman logo on the bottom of the feet with elastic at the ankles and at the tops of the booties to allow them to stay on the infant's feel. These booties do not have the white trip that is pictured above. The headband has red elastic that goes comfortably around the head with a plain blue bow and sewn on Wonder Woman symbol on the front. Check out our Superman Onesie for baby boys!